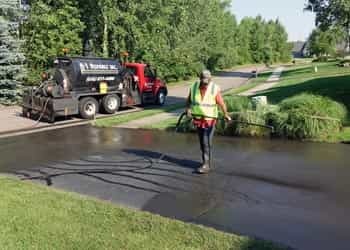 Asphalt sealcoating remains a cost-effective and reliable option for protecting and maintaining the life of the asphalt surfaces around your home or business. Sealing your pavement will not only protect your investment, but will make your asphalt look brand new, help the surface to resist oil, gasoline and other chemicals and extend the life of your parking lot, roadway or street. Using a asphalt sealcoating mix, our expert technicians can restore your parking lot, road, street or other surface — almost to its original condition. Using a special machine applicator this material contains a very large amount of sand but can be applied in a single pass while it is being mixed. The asphalt sealcoating technicians at A-1 Asphalt Inc know from experience that completely replacing your driveway, parking lot or road is not always an option. Fortunately, our asphalt sealcoating professionals can help you preserve the look, function and longevity of your asphalt surface without the costs of full replacement. Regular sealcoating of your pavement or existing asphalt surface will save you hundreds or even thousands of dollars in repairs and resurfacing costs.